Search engines like Google and Bing continue to allow businesses (or individuals) to buy prominent listings on their search results pages. We’re here to help you discover how online advertising can be much more cost effective, with completely trackable ROIs, than what you might be used to. As part of your comprehensive online marketing strategy, a solid Pay-Per-Click (PPC) campaign can inject your SEO and content marketing efforts with a sizeable caffeine jolt. But that’s not all. There are unique advantages to well-executed PPC campaigns that no other method of online marketing can provide. If you are a newer business, PPC’s immediate results can help you gain exposure more quickly. If you have recently rebranded, it’s a great way to make sure you stay at the forefront of your industry and preserve your previous SEO efforts. If you want to test various aspects of your marketing message, PPC can allow you to create uber-specific, targeted campaigns, and strategically adjust the wording to track any variance in results. If you’re looking to focus on a certain demographic or locale, PPC allows you to choose which parts of the globe will view your ad. If you need to specifically track your advertising results, PPC can quantify the traffic coming from your ad, and the keyword effectiveness of your ad content. This can also help you better define your target audience. If your business is launching a short-term campaign, introducing a new product, or reaching out to a new audience, PPC can give you an almost immediate traffic surge to help get the word out and boost activity. When you use i7 Marketing for your PPC efforts, you will have a Google-certified advertising team at your disposal to help you stay on budget as we write irresistible copy for your ads and landing pages. 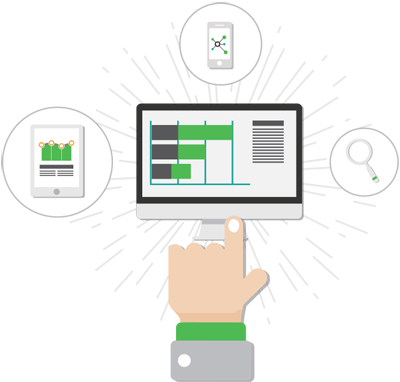 We’ll monitor your campaign closely, testing and improving the results as needed. We can decrease the cost-per-click, increase clicks and impressions, and ultimately, increase conversions. Welcome to your new position at the eyelines of Googlers everywhere!